New kitchen displays at our Blackburn showroom! Sometimes the best designer kitchens are the simplest. And that’s certainly true of our newest display. 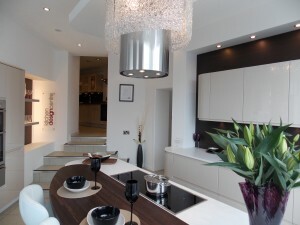 Why not drop in at our Blackburn showroom and see for yourself? 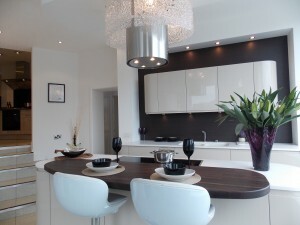 This corien worktop design, fused with a solid wood finish was a response to popular demand from customers. Its curvy design is what makes this designer kitchen so unique and different. 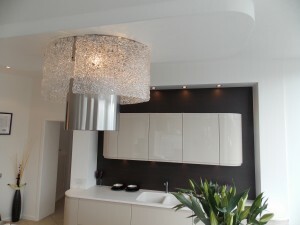 One of its major strengths is the cooker island extractor fan, which hangs from underneath the chandelier. If you’re looking for a focal point in your designer kitchen this island hood will certainly do the trick. Of course it boasts all the latest appliances too, like Neff induction hobs, double oven and warming drawers. The display’s extractor fan, the F-light Nest, utilises advanced technology and stylish design. The exclusive range of lamp extractor hoods from leading manufacturer Faber are perfect for all types of cooking, thanks to their refined style – lighting up the hob with a hi-tech touch. There are seven models in the F-light collection. They feature a two-fold technological core presented in an impeccable exterior. Outstanding extractor hoods and lamps, they have the same lighting power as traditional lighting systems and can be connected and turned on directly using a wall switch or be used independently from the hood controls. The display also includes induction hobs. Have you considered induction cooking? Induction is the only cooking surface that not only provides ultra rapid & precise heating, but also saves an astounding amount of energy! An induction cooktop looks similar to a radiant stove from the surface in that it does not employ open flames. It has a smooth, glass surface on which the pots and pans are placed, with elements located beneath the surface. However, what looks the same as a radiant cooktop at a glance is totally different as far as the operating mechanism employed below the glass surface. By placing an induction-ready cooking vessel on a live induction cooktop, a reaction is generated between the cookware & magnetised coils situated beneath the cooktop surface. This magnetic reaction creates a warming effect within the cooking vessel itself (not the cooktop). This way, the heat that will cook your food is actually created in the pot: in other words, the pot itself becomes the heat source, not the cooktop!